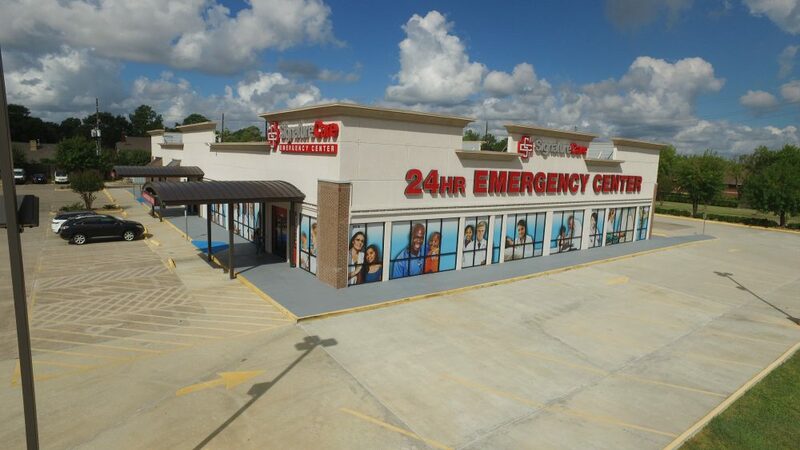 Our emergency room in Sugar Land, TX area is the ER residents of Sugar Land and Mission Bend depend on for 24-hour emergency medical services. When a medical emergency occurs, there’s no time to lose. The sooner you get to the closest emergency room, the higher your chances for a full recovery. Our Sugar Land / Mission Bend emergency care doctors are always available and ready to help. Located at 8910 Hwy 6 South. Houston, TX 77083, we provide emergency medical care services to residents of Sugar Land, Alief, Richmond, Meadows Place, Rosenberg, Mission Bend, West Oaks, Eldridge Park, Pecan Grove, Kingsbridge Estates, Woodbridge Estates and other areas surrounding 77083 zip code. At Mission Bend and Sugar Land SignatureCare Emergency Center, we strive to provide world-class, advanced emergency care. Our emergency rooms function exactly like a hospital ER, except we have little to no wait times. Our freestanding emergency room is open every day of the year. We’re conveniently located near you in Sugar Land and Mission Bend area so that no time is wasted when an emergency situation arises. We provide a level of emergency care and treatment that one would expect from a major hospital ER, but our smaller size allows us to focus our treatment efforts. This reduces wait times for patients who need quick treatment. It also ensures that each patient gets a face-to-face meeting with a board-certified physician. There are many reasons to make SignatureCare Emergency Center your first choice for all Sugar Land and Mission Bend emergency medical care. We provide multiple on-site laboratories and technologies for a comprehensive care solution. This means that patients in our facility don’t have to search through a huge medical complex for a total care experience. They can access all of our services in one convenient emergency room. SignatureCare Emergency Center has teamed up with Uber. Click to order a ride to our Sugar Land Emergency Room now. SignatureCare Emergency Center is committed to providing the best medical care with our state-of-the-art facility, advanced technology and board-certified doctors, nurses, and pharmacists. We’re proud to provide Mission Bend, Sugar Land, and nearby neighborhoods with top-level emergency medical care, including Richmond, Rosenberg, Missouri City, Katy, and Alief. In the College Station Area? Visit our New College Station Emergency Room (ER). Now Open 24 Hours and accepting most forms of medical health insurance. Dr. Shelise Edwards is a board-certified emergency medicine physician who has been with SignatureCare since the beginning. She currently serves as Medical Director for the Mission Bend location. Originally from Tallahassee, FL, she completed her medical school training at Morehouse School of Medicine in Atlanta, and her emergency medicine residency training at The University of Chicago in 2005. She worked as an attending physician in Atlanta as well as Chicago, before relocating to Houston in 2011. Dr. Edwards enjoys spending time with her husband and 2 kids relaxing at home, watching movies and traveling.